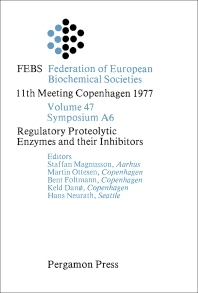 Regulatory Proteolytic Enzymes and Their Inhibitors consists of contributed papers from the 11th Meeting of the Federation of European Biochemical Societies in Copenhagen in 1977. This collection describes the role of proteases in the physiological regulation, a matter of the activation and de-activation of enzymes. The text also discusses the activation mechanism of pepsinogen and other acid protease zymogens. One paper reviews a discovery — that of a separate and distinct class of precursors, the pre-secretary proteins, and then discusses other studies on preproinsulin. The text then discusses the primary structures and presumed functions of immunoglobulin precursors. Another paper continues with the work of Reich and co-workers who found that transformation of cultured fibroblasts from different species by oncogenic viruses is related to the production and release of proteases that are responsible in activating the proenzyme plasminogen into plasmin. Another paper discusses plasminogen activation as having some relationship with pathological processes. The book also reviews the plasminogen activator secretion by normal and neoplastic human tissues. The text discusses the results when primary cultures established from biopsies of normal kidneys secreted plasminogen activators in amounts over those secreted by actual malignant tissues. The book then notes the role of neutral and acid proteinases in male reproduction and the role of plasminogen activators in female ovulation. This collection can be useful for micro-biologists, research biologists, molecular scientists, and students of molecular biology.